Regular followers of my blogs will probably know that I am a big fan of the Isle Of Man, as I have featured photos from there several times before. In my latest trip I was looking for something a bit different to bring back, rather than just a handful of pretty landscapes (not that there’s anything wrong with that). The last horse drawn tram of the day. We start with something I snapped as the sun went down on Douglas Prom. The famous (and almost unique) horse drawn trams were winding to a close for the day and I heard the last run approaching from behind. Now, the Prom is busy with traffic and cluttered with signs, making a nice clear shot tricky, especially when you’ve only a few seconds to plan it. 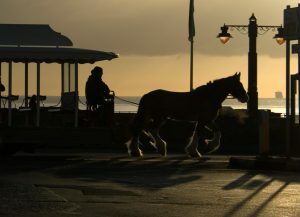 I thought to myself, how nice a silhouetted shot of the passing horse might be against the light with resulting long shadows and this was my result! Now the approaching ferry on the horizon was a bonus and tight cropping removed cars and most of the ugly street signs. Voila! 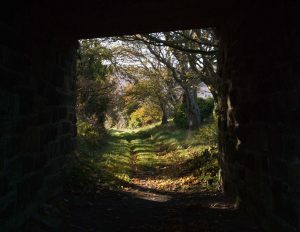 One of the enchanting old railway walks. 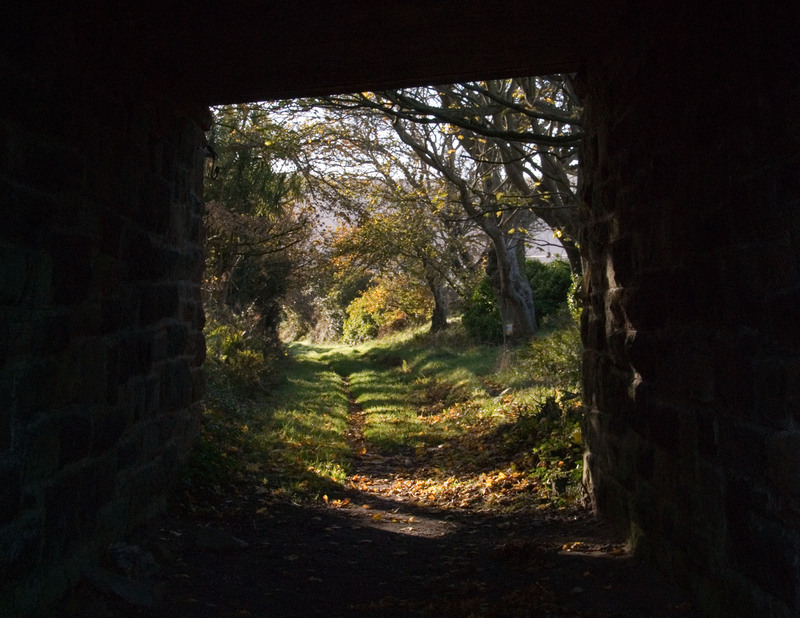 The following day, with sparkling sunshine I set off on one of the delightful old railway walks on the island. 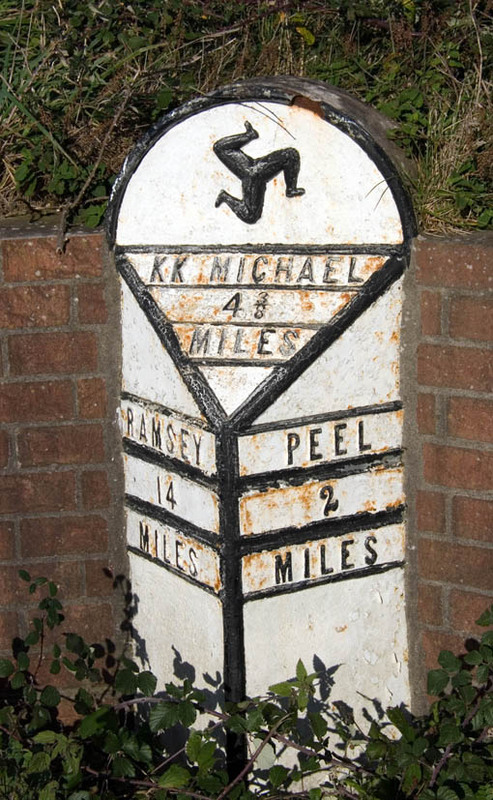 This shot was taken at what was once Peel Road Station on the line that went on to Ramsey and closed in 1968. 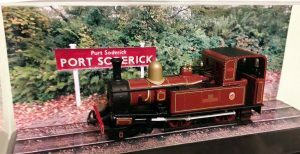 I couldn’t have imagined a more picturesque railway journey than this one from Douglas across the island and up the rugged west coast to Ramsey. I was happy to have walked a small piece of it. 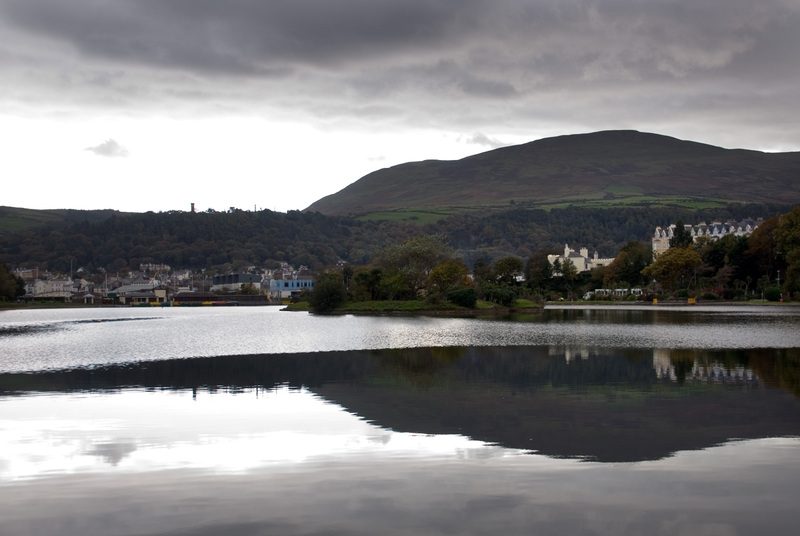 Having lost the morning sunshine by the time I reached Ramsey, I settled for a more moody shot from Mooragh Park with it’s lovely large boating lake, to the town and the imposing backdrop of mountains that dominate the central northern half of the island. I waited patiently for the breeze to die down enough to give me quite a nice reflection on the pond. 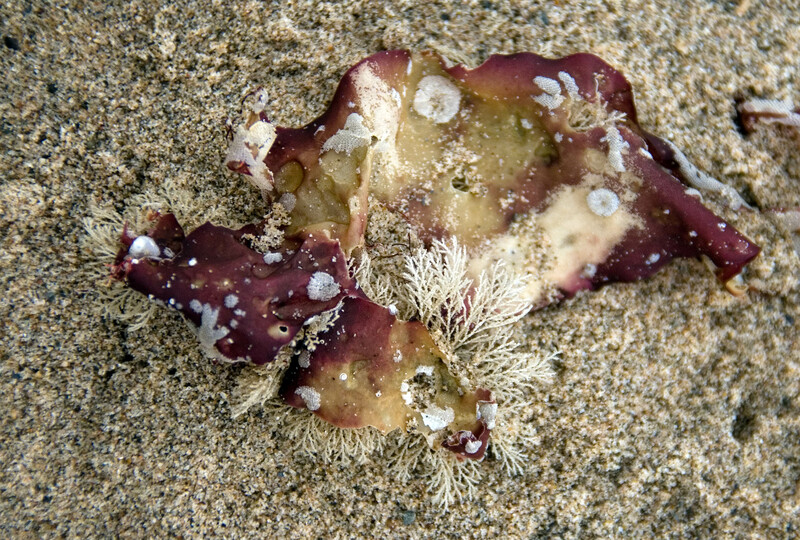 Walking back along the beach, this beautifully colourful and textured piece of seaweed caught my eye and I thought worthy of another quick snap as I passed. My journey back to Douglas was by the electric tram and being almost at the end of the season, I had plenty of space for photography. 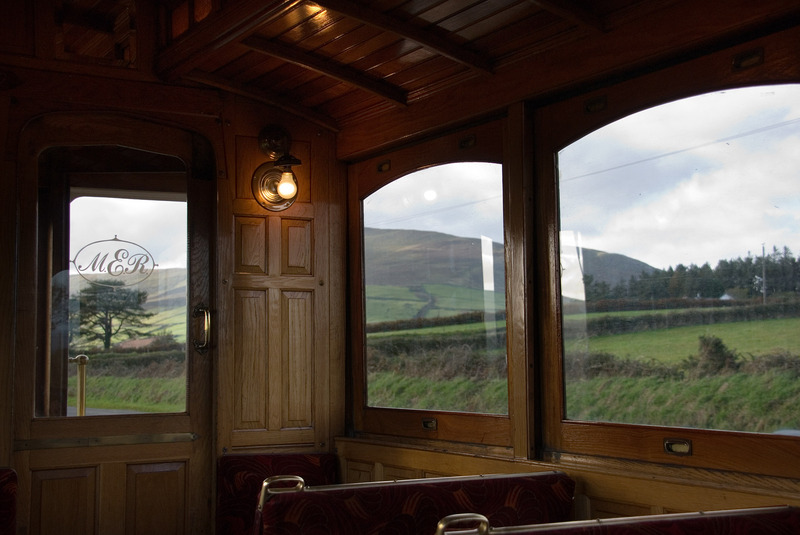 It’s hard to decide whether the best view was inside the beautifully preserved Victorian tram, or through the window at the passing countryside, so I opted for both! 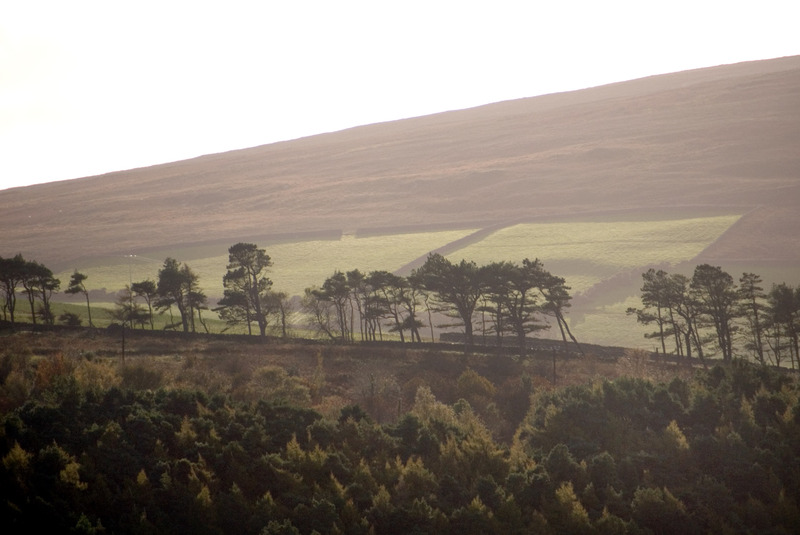 There’s something about a majestic line of trees contrasting with a hazy backdrop of hills or sky that really appeals to me. I was looking almost straight towards the sun for this shot (above), taken through the tram window. 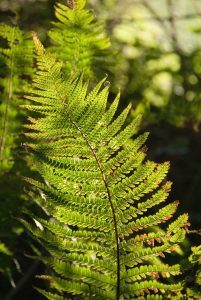 Another favourite shot of mine is when the sun shines through a leaf, in this case bracken. 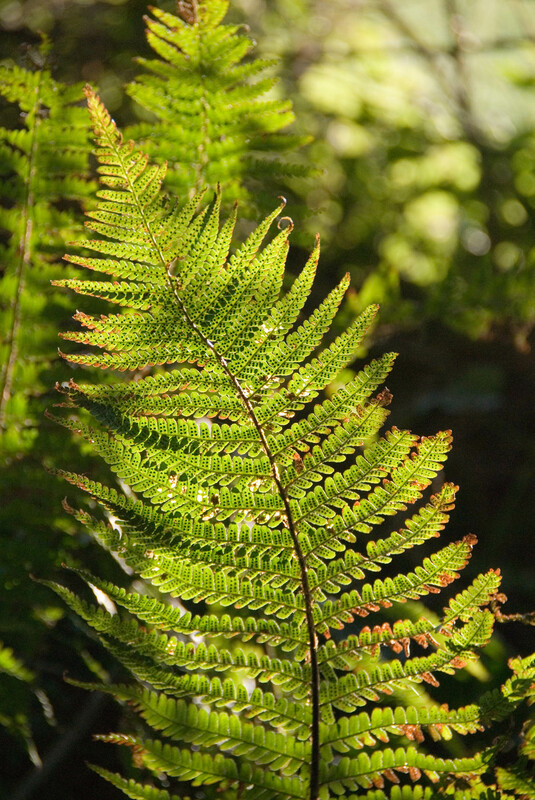 You get lovely colour and a leaf that ‘glows’ against ideally a dark or blurred background. Nature at it’s best. A curiosity on the Isle Of Man in late summer/early autumn is the extraordinary abundance of wild fuchsias. Whilst yellow gorse dominates earlier in the year, in contrast the red and purple fuchsias take over from late summer. 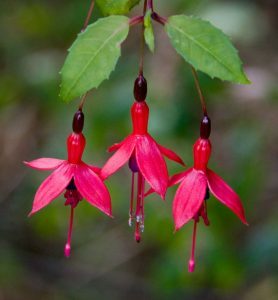 I’ve never seen a fuchsia ‘tree’ before, but they were everywhere and as I later read on the internet, were introduced to a garden in 1820, spread like mad and loved the climate so much they grew into exceptionally tall plants. A delight to photograph, I worked hard to get the best shot of them to illustrate my visit. 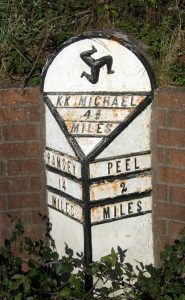 It’s nice to see some ornate old mileposts surviving and marked with the distinctive three legs emblem that is on the flags and everywhere on the island. 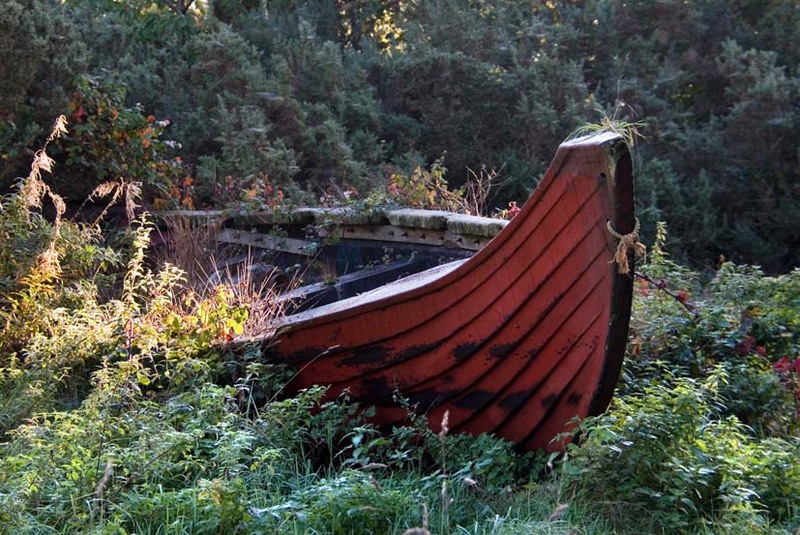 I was puzzled to see a rowing boat in a field, miles from any lake or the sea, but thought it was interesting enough to snap. I would love to have known how and why it was there. 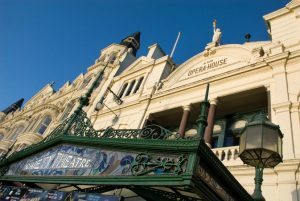 Glorious Gaiety Theatre in late afternoon sun. Back in Douglas and a highlight in the middle of the the Victorian promenade is the stunning Gaiety Theatre; surely one of the most architecturally spectacular theatres. 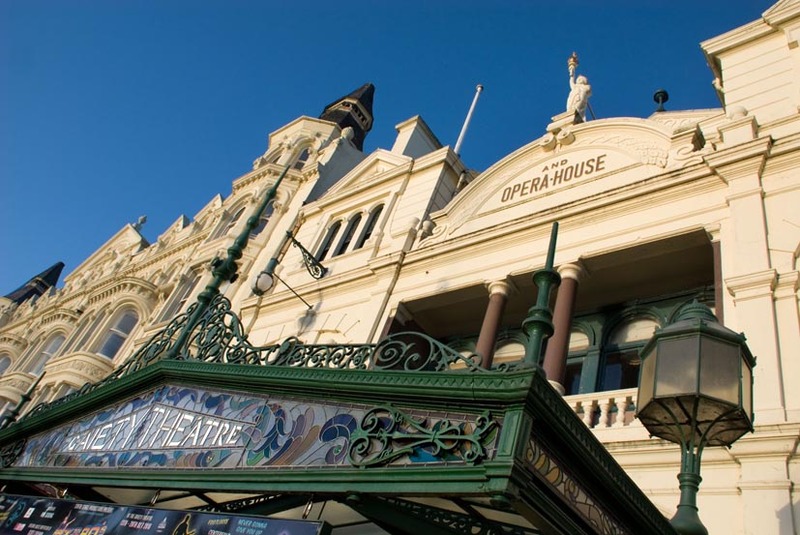 It was deigned by the famous architect Frank Matcham and opened in 1900. It’s just as beautiful inside and I have to say puts on some great entertainment too! 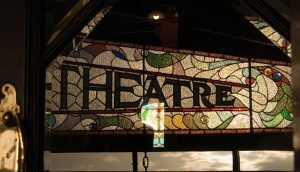 There’s some lovely stained glass incorporated into the building too, which I always love to photograph. 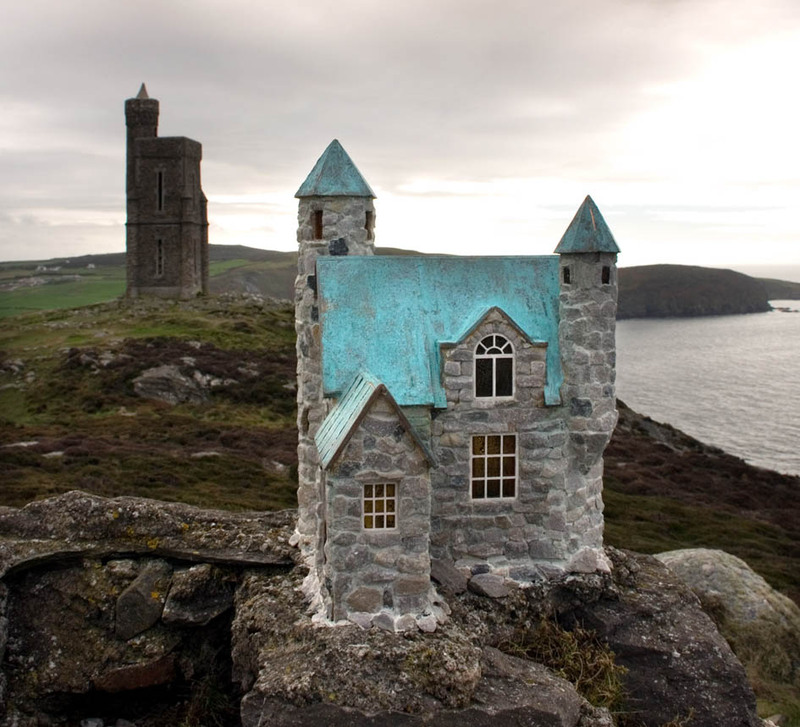 On top of Brada Hill near Port Erin stands not only the well known tower (which is rather taller than it looks in my photo and give superb views over the southern tip of the island), I found this curious little model house. It is beautifully made and cemented to rocks, but I have absolutely no idea who made it or why. At a low angle I expect it could have looked quite ‘real’. 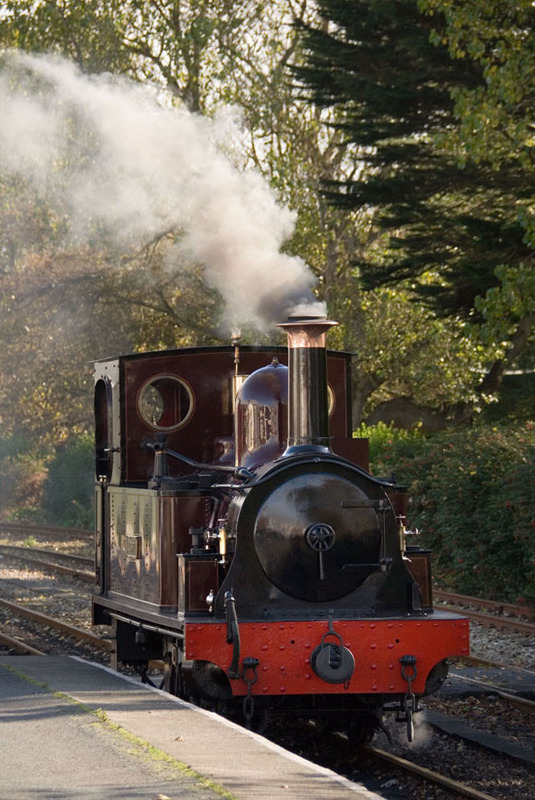 I couldn’t go to the Isle Of Man without a trip on the lovely narrow gauge steam railway that runs between Douglas and Port Erin. 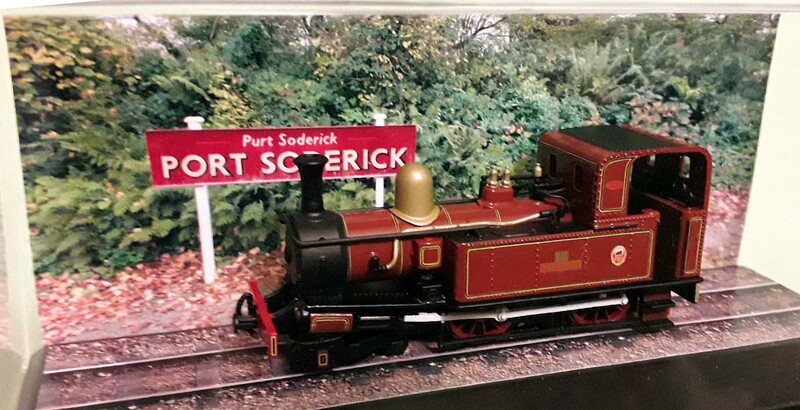 A great souvenir of my trip, I thought, was purchasing a model of the train that I had just ridden behind. Me being me of course, I ‘improved’ it further by snapping a bit of track and background to give a better and more ‘real’ look in it’s display box. Photographing the track wasn’t as easy as you might think. I used Photoshop to ‘re-angle’ my view from the platform edge to look like I was directly above and then had to duplicate it several times and join it together to make the right length, before printing it to size.